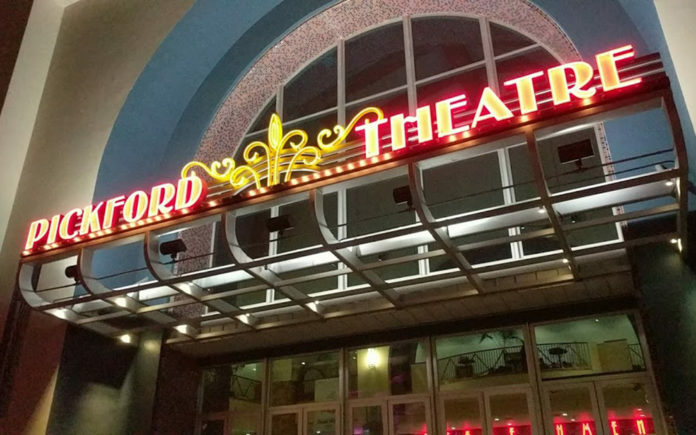 With attention to detail and unique attributes, Mary Pickford Theater in Cathedral City offers a special movie experience you won’t soon forget. Admittedly, it had been well over a decade since I’ve been to the movies at the Mary Pickford Theater in Cathedral City. I think the movie that I saw there was Two Weeks’ Notice with Sandra Bullock and Hugh Grant. Since then, I had become settled in my east valley movie watching ways. However, I do remember enjoying both the movie and the theater back then. But how the theater has changed for the better now, is very impressive. The grand theater was built in 2001 in Cathedral City, just steps away from City Hall. It was named after silent movie actress Mary Pickford, and at the time, featured memorabilia from the actress. In 2016, the theater was acquired by D’Place Entertainment, and changes soon ensued. As owner Damon Rubio gave me a tour of the theater, he pointed out that their focus is to give every movie goer a special experience. They have paid pinpointed attention to creative ways in which to achieve their goals, so every guest, young to mature, will have a memorable movie watching time. All of the 14 theaters have been remodeled, have digital projection, and super comfy cushy lounge recliners. 12 of the theaters offer the motorized Kick Back Seating, and the Escape and Grand House have the Plush Rockers, which are not motorized, but the theaters do offer larger screens. These seats are awesomely comfortable, as they have a cradling effect. They don’t bend your body like other recliners do. It’s a relaxing feeling, almost therapeutic. They have also redone the restrooms, with gorgeous white/grey marble looking tiles, and even a little tissue dispenser at the door upon exiting to open the door, for all the germaphobe’s out there like me. It’s that kind of attention to detail that is very much appreciated. 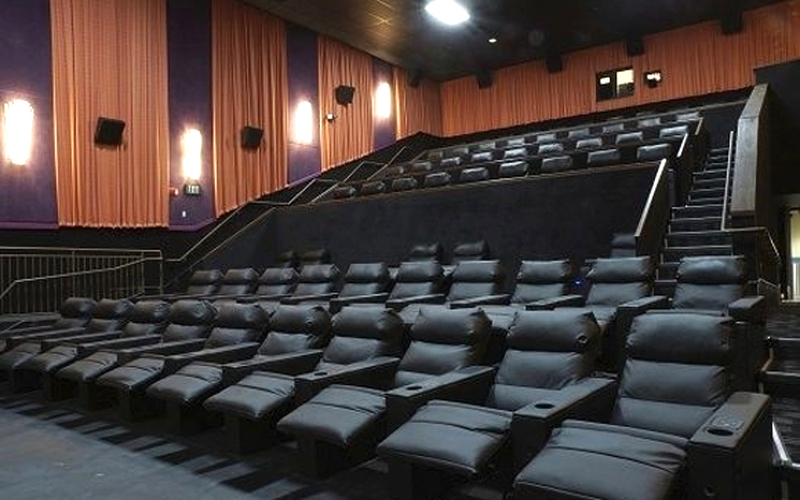 The Mary Pickford Theater highlights ways to enjoy movies unlike any other theaters in the desert, such as offering D-Box seating, which allows the guest to literally move with the film. It is synchronized to the motion, of the motion picture. So let’s say there is a scene where the characters are in a boat speeding through the water, the seat will move accordingly. There is a sample seat in the lobby, where guests can test out the sensation while watching a trailer. After a few minutes in the chair, I must say, it was enjoyable and I can imagine how fun it would be watching an entire action movie while sitting in the chair. There are 20 of the D-Box seats in 2 of the theaters, at an additional charge of $7 on top of the regular ticket price. It is well worth the price and takes movie watching to a whole new level. Another fun extra is the Selfiew.me Interactive Photo Booth. This complimentary feature allows guests to pose alongside selected movie scenes and characters, and then pictures are sent by text or email, ready to share on social media (if desired). It’s completely fun, and another way Mary Pickford Theater amps it up. There is also an arcade, and Rubio explained how there will be a Vitural Reality Station coming soon. Where guest will feel the exhilaration of feeling that they are really in the movie, at the movies. Exciting! Something that D’Place Entertainment has also stepped up is the food at the theater. Honestly, it smells so good in there, like a bakery mixed with a popcorn shop. Dreamy! They have upped the theater popcorn game by making their own popcorn, made from in-house recipes. They offer Cheese, Caramel and Kettle Corn, as well as plain. They also make their own cookies and ice cream. The ice cream is front and center, scooped on request with flavors that include, Vanilla Raspberry, Cappuccino, Rocky Road, Chocolate Oreo and Mint Chip. Rubio suggests making an ice cream sandwich with their fresh baked cookies, done deal! They also have fresh pressed Paninis, and wine and beer options. Apart from showing the latest movies, Mary Pickford Theater also hosts movies during the Palm Springs International Film Festival, and most recently, the Native American Film Festival. To make movie outings affordable, the theater offers a variety of specials, such as the Kids Summer Movie Series, $5.95 Early Bird (offered every day for the first showing), Tightwad Tuesdays ( most movies $5.95 online and at the box office) and Golden Wednesdays ( 55 + receive an extra discount and a free popcorn and coffee with a ticket purchase). And for those who enjoy a good classic, in September the theater will be screening classic films such as West Side Story and South Pacific.